Rob and I have been hosting non-stop gatherings this summer and we finally had a weekend to ourselves. We continued our summer grilling. The only difference is that this time I took a photo of my plate of food before I dug in. A plate of bountiful vegetables. Mojito-inspired tofu skewers, sin rum. 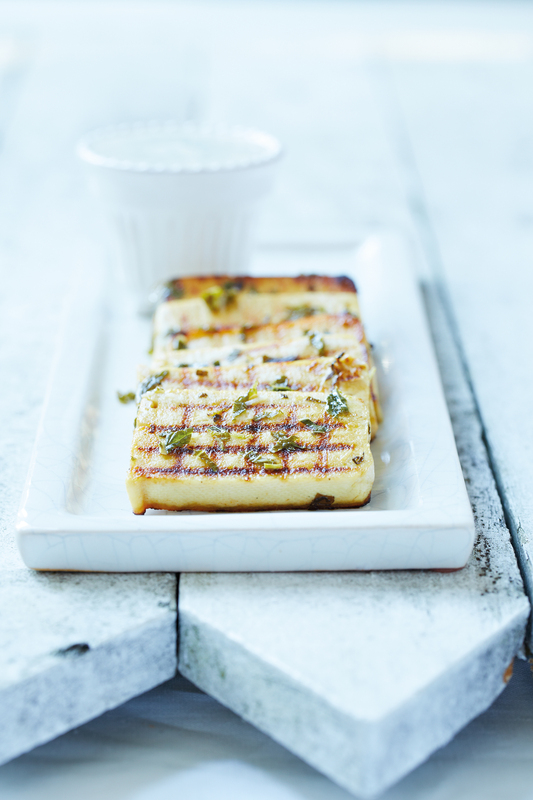 Perhaps better rechristened as lime-mint grilled tofu. Mojito-inspired zucchini coins, sin rum as well. I really enjoyed everything. It seems a tad busy but they were all very good. I liked the lime-mint marinade for the tofu. I used my newest favourite tofu (especially for grilling). However, since the package was only 350g, I supplemented with zucchini. 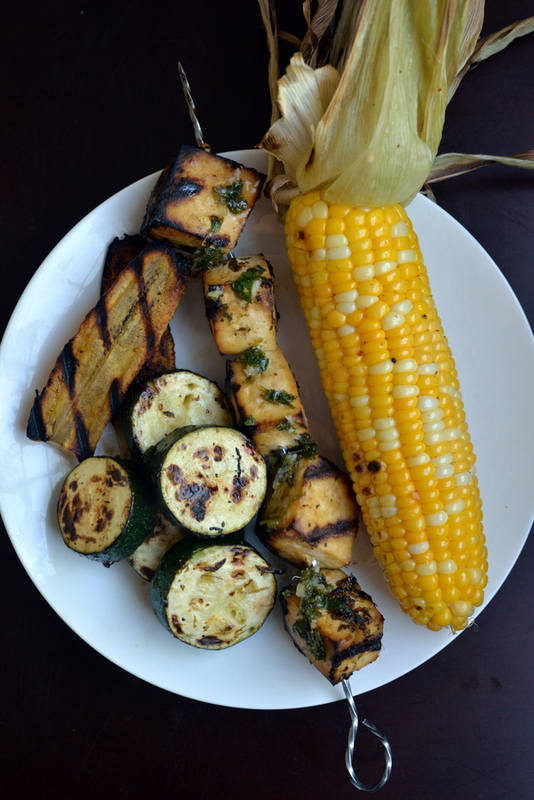 They were grilled and then topped with the extra marinade for a bright minty lime flavour. The plantains and corn also shared the same mesquite-spiked oil (Mesquite seasoning and melted coconut oil). Instead of making plantain coins for the skewers, Rob found it easier to grill slabs of the plantain instead. They were equally sweet and smoky as last time but we didn’t lose any into the insides of the barbecue. Rob’s mom gifted us some incredibly sweet corn from Woodstock and we wanted to keep things simple. 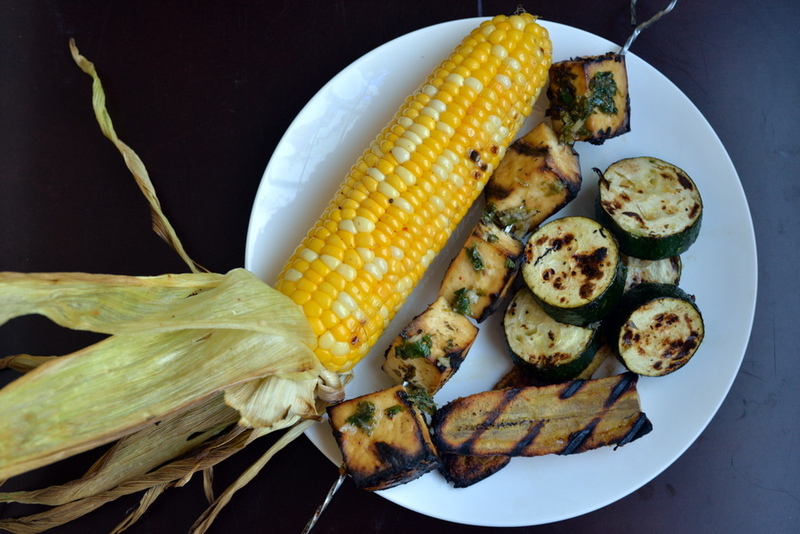 We returned to keeping the husk on the corn while grilling to help it keep its moisture. We’ve made it with rosemary and garlic before, but this time, we kept it simple with the mesquite seasoning. The mojito-inspired tofu comes from a fabulous cookbook, Vegan al Fresco. I have been working my way through it this summer and absolutely loving it. The theme of the cookbook is “happy and healthy recipes for picnics, barbecues and outdoor living” and it definitely delivers on its byline. The cookbook is broken down into finger foods and appetizers, sauces/dips, sandwiches/spreads, salads, foods to grill, baking, desserts and drinks. Plus, it also has tips for packing picnics and hosting meals outdoors. All recipes are vegan. Most are creative vegan spins on traditional American fare. Samosa spring rolls, caper and edamame dip, chipotle and peanut butter hummus, peanut butter adobo barbecue sauce, cilantro barbecue sauce, jalapeño and cherry jam, quinoa and avocado ‘slaw, peanut potato salad, lime and ginger tahini tofu skewers, strawberry and basil scones, chilled blueberry chocolate pie and vanilla ice cream with cherry pie filling. Also, let’s not forget drinks like ginger lemonade. Trust me, there are a ton of fun recipes here. If you are looking for boring, this is not the book for you. Just look at Tracey’s photography of the tofu! I will be sharing a few of my favourites from the cookbook but wanted to share this one prior to Labour Day. Enjoy! Thankfully, the publisher allowed me to giveaway the cookbook to a reader living in the US or Canada. To be entered in the random draw for the book, please leave a comment below telling me what you like to bring to a picnic or barbecue. The winner will be selected at random on September 4, 2015. Good luck! I am sharing this with Meat Free Mondays and Healthy Vegan Fridays. Carla’s note: My husband is a restaurant manager, and one day he had to spend eight hours making mojitos at a charity golf tournament his restaurant sponsored. His unfortunate experience inspired me to use the refreshing Latino flavors of the mojito as a delectable marinade and basting sauce for barbecued tofu. Bad for him, good for the rest of us! 1. In a large flat container with a resealable lid or in a large zip-close bag, combine juice, rum, mint, agave, oil, garlic, lime zest, and salt. Add tofu and marinate in refrigerator for at least 1 hour, turning after 30 minutes. Recipe from Vegan al Fresco: Happy & Healthy Recipes for Picnics, Barbecues & Outdoor Dining by Carla Kelly. Published by Arsenal Pulp Press (2014). Recipes reprinted with permission. Fresh corn from the farmer down the street. 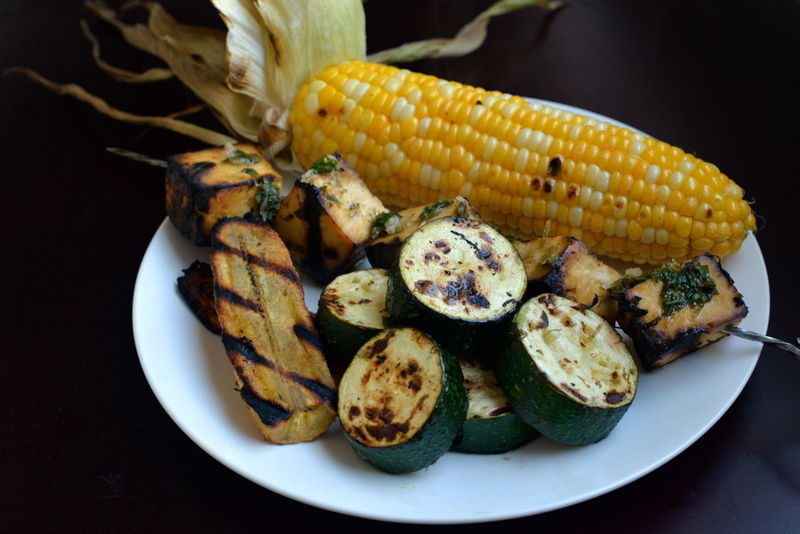 Oh, your photos are so beautiful – they make me want to grill something and eat outside! To my own picnic, I would like to have some spicy BBQed tempeh and make some sandwiches with it on toasted buns. To someone else’s cookout, I’d probably stick to a potato salad with guac dressing. No one ever knows that’s vegan. Plus, it’s green! This book looks great. I like to bring a pasta salad to picnics/bbqs–that way I have a main to eat, instead of just snack bits. I like how you roll 😀 I’m glad you’re enjoying your new place Janet! A salad of some sort. If I want to do something on the lighter side, I tend to bring a slaw but if a more substantial dish is warranted, I will go with a quinoa or bean base and build from there! I always like to bring something fresh & healthy to balance out the heavier fare my friends usually bring. Garden Salad, 3 Bean Salad, Fruit Salad, and lowfat-whole wheat-veggie filled-Macaroni Salad are all common items for me to bring along! 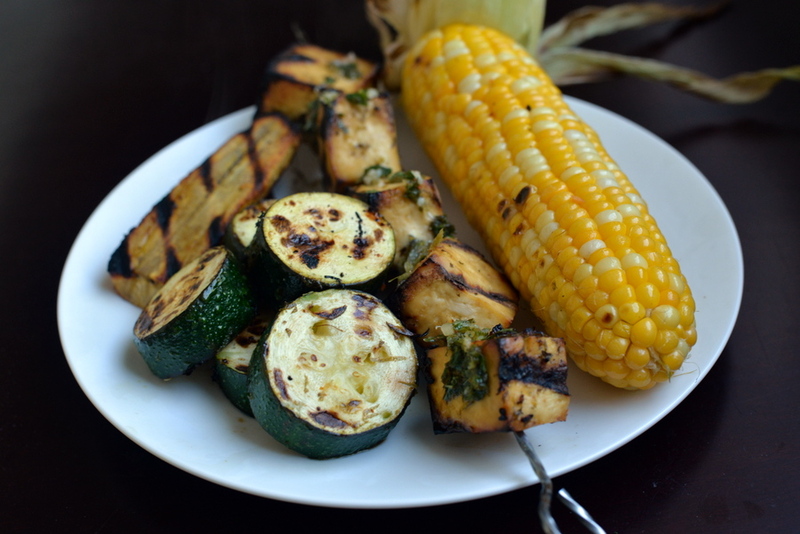 Ohhhh… I’ve never tried to grill tofu. I love the look of the char on this! I make baked beans or Mexican rice & beans; both go over well with junk food eaters, despite the fact that they feed health instead of disease. Bok choy coleslaw with different dressings to accompany the main dish. I love al fresco dining anytime of year! I love to bring fruit salad. I love making chickpea and black bean burgers at picnics with family and friends. They are always surprised by how tasty they are without any meat in them. We really need to dust off our BBQ. Everything looks so good here! I love the idea of mesquite-flavoured oil – I’ll have to try that. Typically, I like to bring a salad of roasted veggies and grains to a BBQ, or a gluten-free/vegan dessert like cookies or brownies. Congratulations, Sondi. You are the winner. Please check your email. Oh, I love tofu for it’s sponge like flavor sucking! I love how you can take something is a blank canvas and make it into almost any flavor out there. I have not grilled tofu on the barbecue before, but this seems like something that could be used as a special vegan dish in a pinch! Love it. The photos are fantastic. I prefer my corn from Taber, Alberta, but my wife prefers the Peaches and Cream corn from here. The debate never ends! What a gorgeous BBQ! We also wanted to have more backyard gatherings (also 1st summer with a back yard), but it’s been so hard to find the time and get people together! Love the idea of mesquite oil…sounds so delicious. 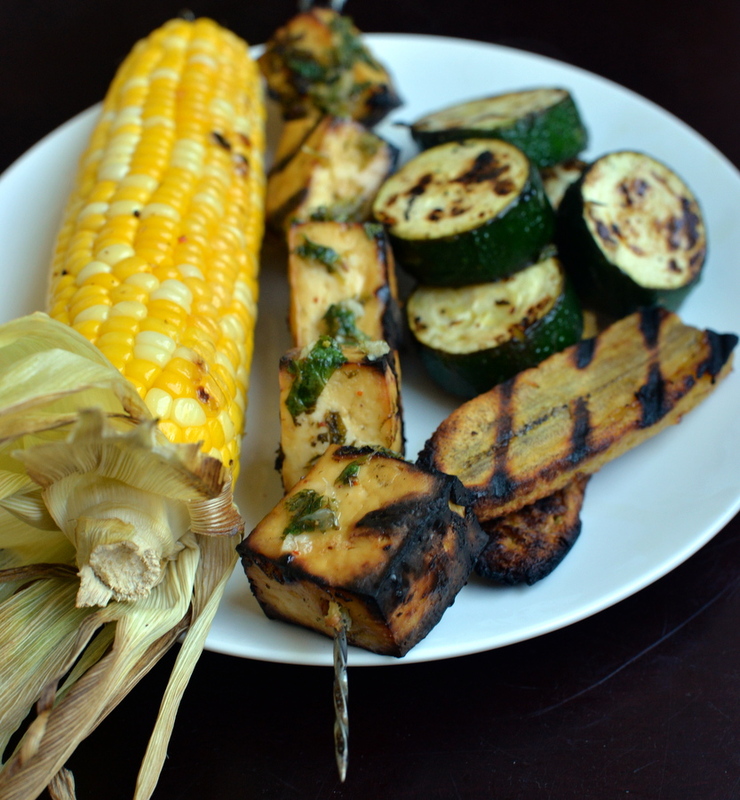 those grilled zucchihni sticks look wonderful – AND the grilled tofu. can’t wait to try them. I like to bring fruit salad or chocolate chip cookies. I usually offer to bring desserts to picnics and barbecues. I love to bring fresh fruit like peaches and pineapple to grill, but I also like to bring baked items, too. At a barbecue I went to earlier this summer, I brought vegan lemon squares and they were a hit. Your whole plate looked awesome! It must have made for a fantastic meal. Bean salads and spring rolls are two of the dishes I think are perfect for picnics. That said, I often find myself wishing for more ideas for picnic-friendly dishes, so this book sounds like it would be a great help. Thanks for bringing it to my attention! I love bringing pasta salad to picnics! I almost always bring a fresh fruit salad and a cold quinoa salad. Ohhh yummm…the tofu skewers is definitely a must try for me soon. Thanks for sharing that wonderful récipé and giveaway. Ohhhh…sorry, I pressed the enter button too fast. For a picnic, I like to bring a kale recipe salad from Dreena Burton’s cookbook and a load of fresh veggies from my garden to give to others. Oh the skewers sound amazeballs. Why do I not live nearly you? It sounds like your bbqs are filled with amazing food.